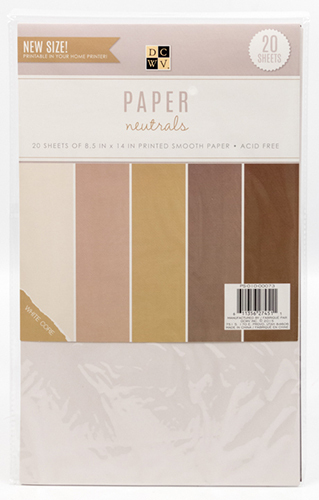 The 8-1/2”x14” Neutrals collection of paper from DCWV can be used in a variety of projects. Made with a lighter-weight paper, one that is just heavier than standard printer paper, these pages can be used for many projects. Some of those items include printing journaling blocks or full invitations straight from your computer, decoupage projects, or more detailed embellishments. The collection of 8-1/2”x14” stacks include 4 additional stacks in a variety of colors. Each one is available at Jo-Ann Fabric and Craft Stores®.